Here at Tradition we offer you food from the Swedish cuisine as it was originally intended: Featured, uncomplicated high quality ingredients that are prepared with knowledge and care. 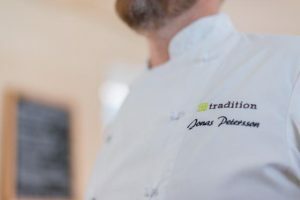 Restaurant Traditions founder Jonas Petersson has worked on international renowned places such as Aquavit in New York and Quaglino’s in London. But even on classic Swedish restaurants Ulriksdals Wärdshus, Basement Aurora and Reisen. And after working with different types of food from different food cultures, he has learned to appreciate the simplicity and good taste as the Swedish food tradition can give. “My goal and desire is that the new generation also will learn to appreciate real homemade traditional cooking. Unfortunately I have seen it disappear more and more through my years as an executive chef, but it seems to me that in recent years it got a little boost again. So I hope that the homemade meatballs soon will reign”.